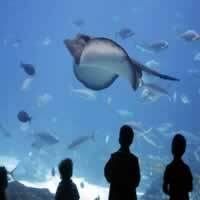 Galway Atlantaquaria is the National Aquarium of Ireland and one of the West of Ireland`s premier attractions. It is home to 170 marine and freshwater species. Visitors will have the chance to hold starfish or spiny spider crab in the palm of their hands, explore an underwater world in a model submarine or help feed hundreds of hungry fish and sea creatures. Other highlights include the display tanks of seahorses, stingrays, sharks and an enormous skeleton of a Fin Whale. The county courthouse was built in 1818 and has received much acclaim for its design and architecture. Next door is the former Town Hall, which was originally used as a courthouse. In 1901 it became the Town Hall, Theatre and occasional cinema. 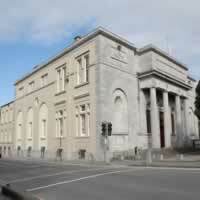 More recently it was used as a cinema but now it houses the Town Hall Theatre, the most popular theatre in the city. 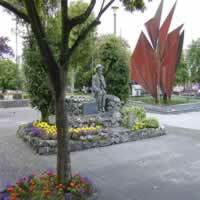 Eyre Square is the center piece to Galway City and was officially presented to the city in 1710 by Mayor Edward Eyre, from whom it took its name. Originally surrounded with a wooden fence, it was enclosed with iron railings in the late 1700s. These were removed in the 1960s, and subsequently re-erected around St Nicholas` Collegiate Church. In 1965, the square was officially renamed `Kennedy Memorial Park` in honor of US President John F. Kennedy, who visited here shortly before his assassination in 1963. The Browne doorway is another notable feature in Eyre Square as it was originally the doorway of the Browne families` home on Lower Abbeygate Street and it was moved in 1905 from Abbeygate street to Eyre Square. Located on Nun`s Island, on the west bank of the River Corrib near Salmon Weir Bridge, Galway Cathedral is one of the largest and most dominating buildings in Galway. Construction of the Cathedral began in 1958 and was completed in 1965. It is located on the site of the former city jail and features a dome at a height of 145 feet. Built in the Renaissance style, the artwork, glasswork and woodwork were all handcrafted by Irish artists and the money for the Cathedral was raised by the locals who purchased and donated each stone one by one. It was the last large church in Ireland to be made from stone, and features a huge octagonal dome that complements the skyline of the City of Galway. Inside the visitor will find the rose windows and wall paintings, which echo the broad tradition of Christian art, particularly impressive. 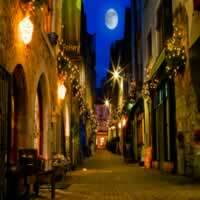 One the finest medieval laneways in Galway, Kirwan`s Lane, located in what is now referred to as the Latin Quarter of Galway contains many relics of 16th and 17th century architecture. 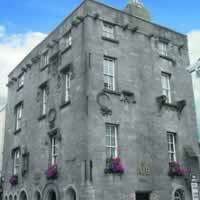 It is at the center of the area that was originally within the city walls, and is named after one of Galway`s fourteen `tribes` - the families who ruled the town for several centuries. The area has been significantly restored over the years and has rejuvenated the heart of Galway`s historical town center. It is now home to many bohemian styles cafes, restaurants, bars and craft-shops. Formerly owned by one of the fourteen tribes which ruled the city centuries ago, this elegant house now houses Allied Irish Bank. Despite this, the interior is still extremely impressive with coats of arms, stone fireplaces and a separate exhibition room which opens from Monday to Wednesday and on Fridays. The Lynches were a wealthy family, many of whom served as Galway mayor. One of the mayors, James Lynch Fitzstephen, actually pronounced his own son guilty of the murder of a Spanish sailor who became involved with a female family member in 1493. Lynch hanged his son Walter himself when everyone else refused to participate. The term `Lynch Law` arose from this unfortunate episode. The old prison on Market Street in Galway City displays a black marble plaque marking the actual spot of the execution. This window commemorates one of Galway`s most enduring legends. 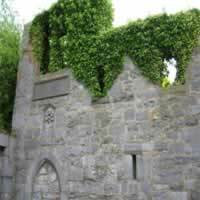 According to local tradition, the mayor of Galway, James Lynch FitzStephen, hanged (or lynched as the practice became known after this event) his son from the window of his home in 1493. Lynch`s son had murdered a Spanish man in the care of the family. Lynch`s Window stands in Market Street at the side of St. Nicholas` Church. National University of Ireland, Galway stands on the banks of the river Corrib. Its stone quadrangle is one of the city`s most famous landmarks. The National University of Ireland, Galway (also known as N.U.I Galway) can be found on University Road, right in the heart of Galway city center. This landmark attraction is a must for visitors to Galway city if only to explore its history and view it`s architecture. 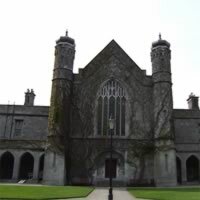 The National University of Ireland, Galway, was established as Queen`s College Galway in 1849. A year later it became part of The Queen`s University of Ireland which also included other universities like Queen`s University Belfast and University College Cork. The college presently has approximately 15,000 students which study in one of seven faculties (law, medicine and health sciences, Celtic studies, engineering, commerce, science and arts). Visitors can enjoy a leisurely stroll around the campus, which is located in the city center and stretches along the River Corrib. The quadrangle is a replica of Christ Church (part of the University of Oxford) and is the oldest part of the university in Galway. 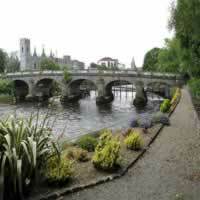 Galway`s famous Spanish Arch is located on the left bank of the Corrib, where Galway`s river meets the sea. The Spanish Arch was originally a 16th century bastion, which was added to Galway`s town walls to protect merchant ships from looting. At this time, it was known as Ceann an Bhalla (Head of the Wall). Its current name `Spanish Arch` refers to former merchant trade with Spain, whose galleons often docked here. In 1755, the arches were partially destroyed by the tidal wave generated by the 1755 Lisbon earthquake. 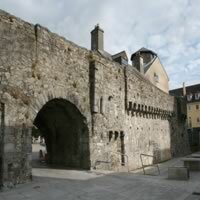 In recent times part of the Arch has been converted into the Galway City Museum. 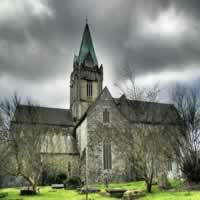 St. Nicholas is the largest medieval parish church in Ireland in continuous use as a place of worship at the heart of Galway`s life. The early sections of the church date from 1320, although according to tradition St. Nicholas was built upon the ruins of an older structure, and part of the chancel`s south wall may incorporate some of this earlier material. It`s said that Christopher Columbus prayed here in 1477 before sailing away on one of his attempts to reach the New World. A tour through the Church will allow you to glimpse the part of its rich history. The church is open all day, every day, and visitors are most welcome. 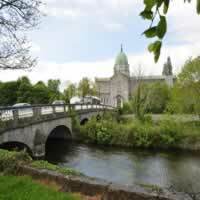 The Salmon Weir Bridge crosses the Corrib from the Cathedral on one side to the courthouse on the other. Many people gather on this bridge in summer to see the shoals of salmon make their way up the Corrib River to spawn. During the salmon season, people stop to watch anglers fishing in the waters below, applauding each catch. There is a magnificent view of the Cathedral from the bridge itself, and the view remains impressive all the way down to Wolfe Tone Bridge. The bridge was originally granted by Henry III to the Earl of Ulster. The Franciscans later held the fisheries until the suppression of the monasteries under Henry VIII, when they were given to the Lynch family. It is now the property of the state. 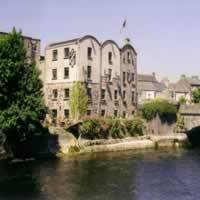 The Bridge Mills is a commanding building on the banks of the Corrib. Restored a few years ago with high regard for its aesthetic and historical features, the 430 year old Bridge Mills is now a center of art, culture and specialized skill-based commercial projects within Galway City. Visitors and locals alike delight in the distinctive, finely crafted gifts, clothing, and cuisine on offer. Thanks for subscribing to Tripmaster.com! Receive the latest deals for travel to Asia, Europe, Hawaii and Latin America. Receive the latest deals for travel to Europe. We have updated your subscription preferences.